See other posts about making Birds of Beebe Woods here. A poster is available from my Etsy Shop. Most of the birds in Birds of Beebe Woods are the colorful male variety, but I decided to add a pair of cardinals to the mix. The female is shown in her nest, which is made of florist’s rafia-like straw. After consulting photographs of cardinals, I did a simple drawing to follow. The basic shape is cut out of matt board and the padding is basted in place. I don’t know what the padding material is made of— a friend gave me a bunch. In this case, I made a felt hood and embroidered feather patterns with variegated thread. 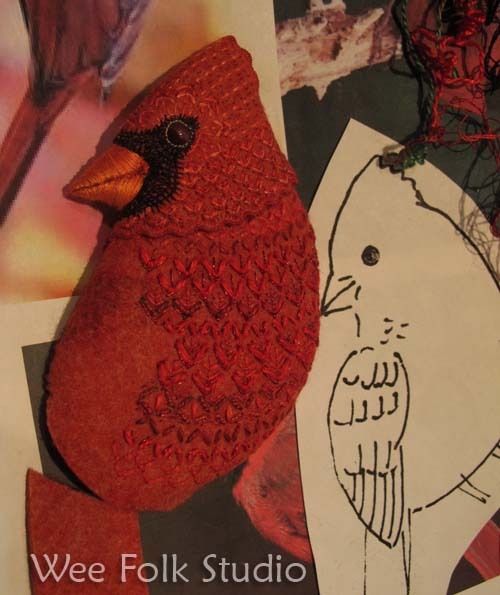 Then, I stitched the beak and surrounded the bead eye with several rows of black blanket stitching. The tail has a wire armature to help keep its shape. 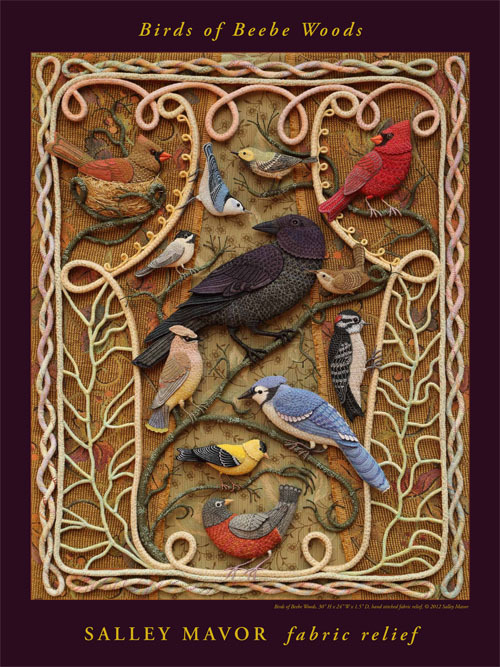 This entry was posted in Animation, Birds of Beebe Woods, Embroidery, Fabric Relief, Felt, Tutorial by Salley Mavor. Bookmark the permalink. the details slowly emerge. The process of making what is in your mind become a reality is so wonderful!!! I love the lichen on the branch holding the nest! 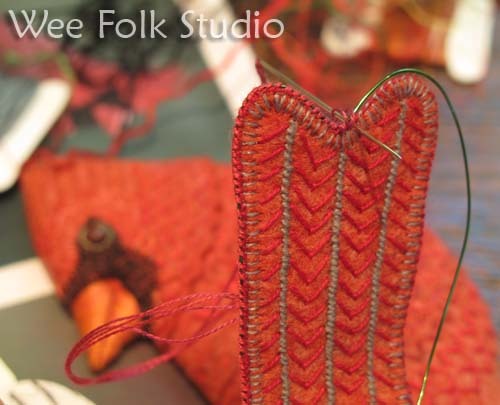 What a delight to see the processes you used for your creations. Hi Pat, thanks for your interest in my work. 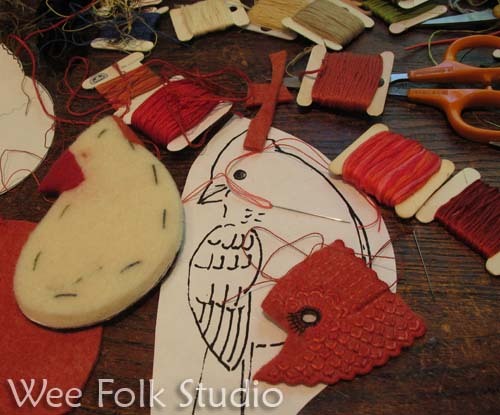 My instructional book, Felt Wee Folk shows how to make more simple projects, like my dolls. The birds are so new that I don’t have any directions. The birds are awesome. thanks so much for sharing. beauty to so simple materials which you use,Me with my little students analise your work and always we wonder how you think to put every stitch to the correct place.Congratulations Saley you are so tallented. Do they all manage to fly back and assume the same position each morning, just before you enter the studio? There’s definitely a twinkle in their eyes, even as they pose so patiently for their portraits. I love your work, and enjoy all of your posts. I am looking forward to visiting your exhibit at The Art Insitute in Chicago in October. I have 2 of your books, including Felt Wee Folk. How do you secure the felt to the matt board? Great realistic, yet whimsical depictions. Donna in Macomb, Il. 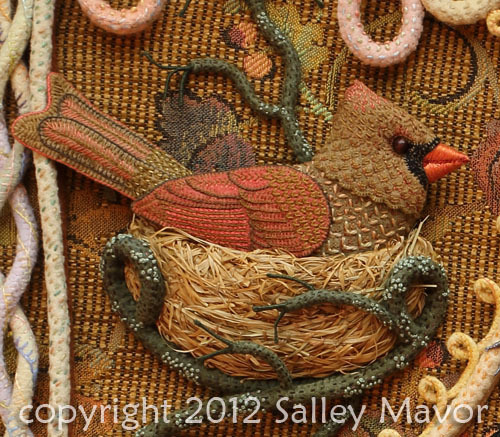 Salley, I’m exhausted just looking at those many tiny stitches that give your birds such life like dimension. You works is Beautiful. You are so inspiring to us that love stitchery. I found your work thru Pinterest and then found your blog. 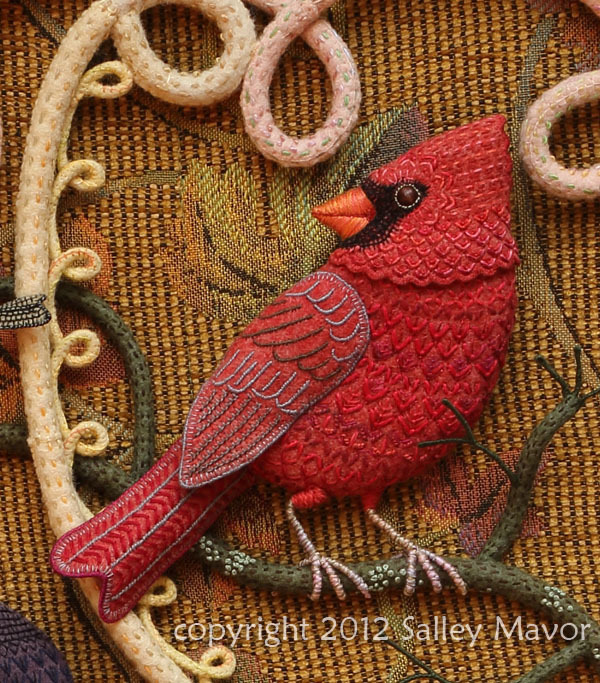 I am in awe of your beautiful stitching and creativity!! I just ordered three of your books from Amazon. Can’t wait to see them!!! Wow how talented you are! The birds are so beautiful! I can’t wait to see your next piece!